Back in March, we brought you word of a crazy new entry from Frederique Constant. They have been in the connected watch game for a while now, but those prior watches all featured quartz movements. That makes sense, since we’re dealing with a watch they designed to not need to be charged, yet still account for fitness tracking and syncing to your phone. With the Frederique Constant Hybrid Manufacture, however, we’ve gone into the realm of a connected watch that features a mechanical movement. That is most definitely what sets the Frederique Constant Hybrid Manufacture apart from any of it’s connected watch competitors. The mechanical movement behaves just as any other one you’ve experienced – it winds via the rotor (visible via the exhibition caseback) or via the crown winding, and you can set the time and date via the crown. So far, very familiar. It’s that pusher over at 9 o’clock that indicates there’s something else going on here. With that pusher, you can activate various displays on the upper register. The default is to flip it from the fitness counter to another display (say, world time), but you can use the app to control how things work. For the default display, I set it to world time, and then a single press of the pusher shows activity level, and a double-press shows the battery life. Of course, you can also see those in the app (and this watch requires yet another FC app for some reason). To sync the Frederique Constant Hybrid Manufacture to your phone, you’ll need to fire the app up with bluetooth on on the phone, and then press the pusher to kick off syncing. 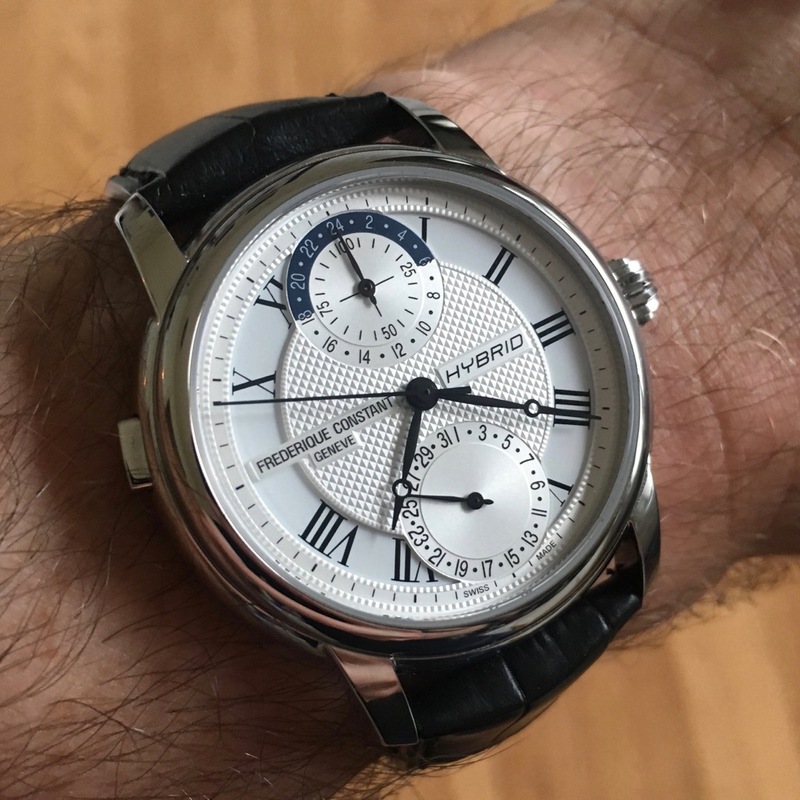 This is a peculiarity to the Frederique Constant connected watches, but one that makes sense. If you’re trying to conserve battery life, you don’t need the watch always broadcasting. With this method, it only kicks the radio on when you want it to. As far as the battery goes, FC claims a 7+ day battery life, and I saw life around that range. Of course, the mechanical portions would continue to work with a dead battery, so that part is of no concern. And really, charging the watch is as simple as placing the watch onto it’s included winder. While our review loaner of the Frederique Constant Hybrid Manufacture did not include the winder itself, we did have the “pillow” that it uses come along (as that’s how you charge it, particularly as you travel) for the ride. It’s a simple USB connection, and the battery charges on up. Again, the winder box would simplify this a good bit. While it may not matter to the timekeeping if you let the battery die, you would miss out on the activity tracking (simple step counts and sleep tracking). What’s the more interesting component of this hybrid mashup, to me, are the movement analytics that we get from the mechanical-digital combination. Sure, there are various aftermarket solutions out there from Lepsi and others, but having this packaged into the watch is a slick bit of packaging and technical chops, and gives us watch folks a view into what’s going on inside the watch. Or, you know, showing when something is going wrong and the watch is in need of service. To my usage (particularly as I wouldn’t find myself wearing the Frederique Constant Hybrid Manufacture daily, so fitness tracking is so-so here) I find this the most compelling part of the offering. Now, I just said I wouldn’t find myself wearing the Frederique Constant Hybrid Manufacture daily. This is not because there’s something wrong with the watch, quite the opposite. This has a lot of familiar FC design lineage to it, and wears quite comfortably on the wrist. It is just that it presents very much as a dress watch, and that sort of limits it a little bit in terms of my own usage. Sure, it would work a few days a week, but for me, daily would be a stretch. Your usage may vary, of course, particularly if your office dress code is a good bit more formal than mine. For wearing it, this was done both with a suit and at the office, and it performed just as you might expect. The hands are narrow, but they stand out in stark contrast to the white dial, and reading the time is breeze (reading the registers is a bit trickier, at least for my eyes). The lug curvature to the alligator strap kept comfort on the table, and I rather liked the buckle that FC used on the deployant clasp. Most brands will have a solid implementation of their logo, but here we’ve got one that’s carved out. It looks sharp, and gives the watch a bit more of a jewelry feel, in line with the luxury target this watch has. Would I wear it? As a dress watch, sure. As an all day, everyday watch? Probably not. What I’d change: Let’s play with micro rotors, or figure out some way of charging the battery via movement, rather than having to plug it in. Also, let’s get all of these apps consolidated into a single one.